So that's what it looks like. 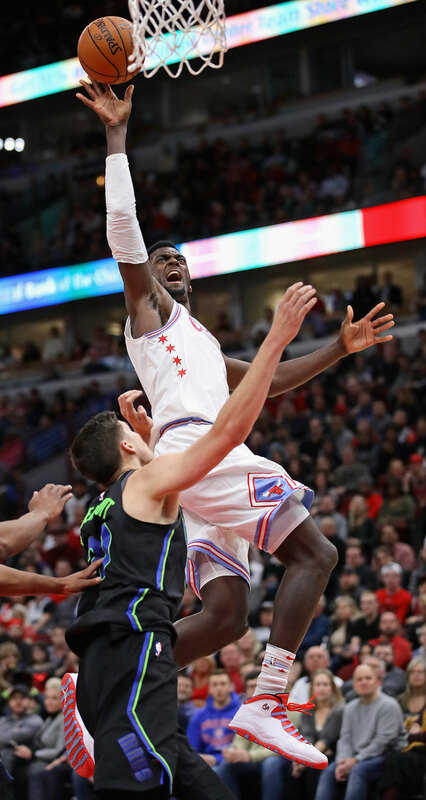 So that's what it looks like when Kris Dunn, Zach LaVine and Lauri Markkanen get it going down the stretch, the Bulls Friday defeating the Dallas Mavericks 108-100 after trailing by 11 points with 10 minutes left in the game. Perhaps the Bulls' destiny finally began to come into view, and it looked appealing. "Today was a little glimpse of what we can do in the future for the Chicago Bulls," Dunn was saying after his 18 points, seven rebounds and seven assists. "It's going to take time. It's not going to be easy, especially when you have three highly talented players and you have another one with Bobby (Portis); that's four talented players. So it's not going to be easy, but I think in due time we will figure it out." Yes, Portis. No one's forgetting him, and certainly not 6-11 Dallas center Dwight Powell, whom Portis backed down and drove over in a crucial fourth quarter sequence when the Bulls scored eight straight points to take their first lead of the game with 3:43 left, six straight by Portis. "Just trying to bring some intensity, an edge to the game," said Portis, who led the Bulls with 22 points, 15 in the second half. "All game they were the aggressors, turning us over; we tried to give it back to them." From there, Dunn dropped in a step back three pointer and LaVine drew the defense and passed to Markkanen at the top of the key for the clinching three-pointer to break the Bulls five-game losing streak. The Bulls moved to 21-41 while Dallas dropped to 19-44. But the significance was less getting the first post All-Star win than the Bulls' prized trio combining down the stretch to make the winning plays on offense and defense. Markkanen had 17 points and a game high 12 rebounds. 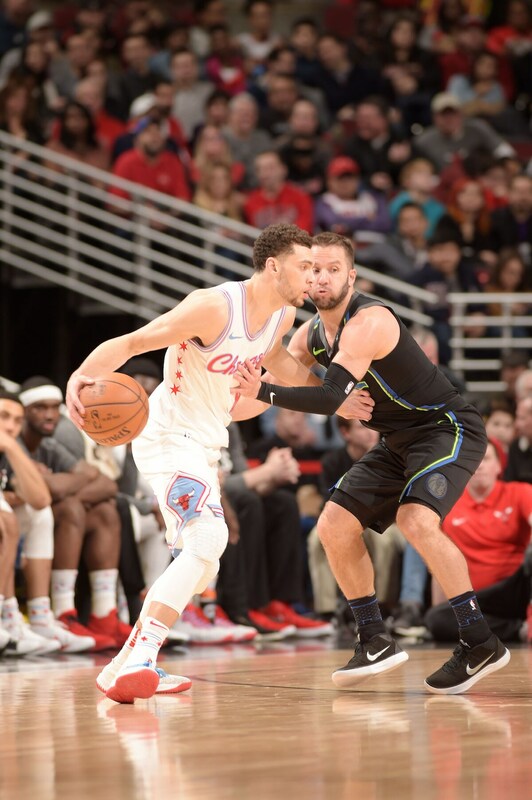 LaVine had 16 points with seven in the fourth quarter and six assists. David Nwaba added 10 points, 11 rebounds, five assists and three steals and what looks like a new starting lineup Monday against Boston. At least, a new starter. Bulls coach Fred Hoiberg indicated after the game that Portis would replace Cristiano Felicio in this next five-game stretch of Bulls rotating starting lineups the rest of the season. Robin Lopez and Justin Holiday remained inactive while Paul Zipser was out again with a foot injury. But putting in Portis with Dunn, LaVine, Markkanen and Nwaba appears to be the Bulls strongest lineup and the lineup the Bulls finished with to outscore Dallas 28-9 the last nine minutes. The Bulls were outscored 32-24 in the first quarter after falling behind 10-0 and 36-31 in the third quarter. The Bulls had a 30-15 fourth quarter edge primarily with that group and Denzel Valentine adding some crucial late playmaking. All the starters had a plus ranking in the plus/minus category except Felicio, who was a minus-17. Portis was best at plus-21. "He's not shying away from anything," Hoiberg raved about Portis. "Sometimes when he gets in that rhythm--he gets in that zone--it's fun to watch him. Those plays he was making in the post, that play over Powell was big time. And he wanted it, too. Zach was calling for the ball screen. I was going to see who was going to blink first. Zach threw it in there to Bobby, and he made a heck of a play on a post up. It's great to have Bobby. He plays with such a swagger and a confidence. He brings that energy every time he steps on the floor. We need it." Though the Bulls especially needed to see what those three players from the Jimmy Butler trade could do, especially playing together, which appears not only to be their future, but the future hopes of the franchise. Friday was just their eighth game starting together with the injuries, personal leave and rehabilitation. "It takes time," counseled LaVine. "You have to get games under your belt. It's not going to be perfect in five, six, seven games; it takes a long time for people to get chemistry. We are working on it each and every game, practice, and we'll continue to build. But today we played good." Very good, really. OK, it's not the Warriors or Rockets. 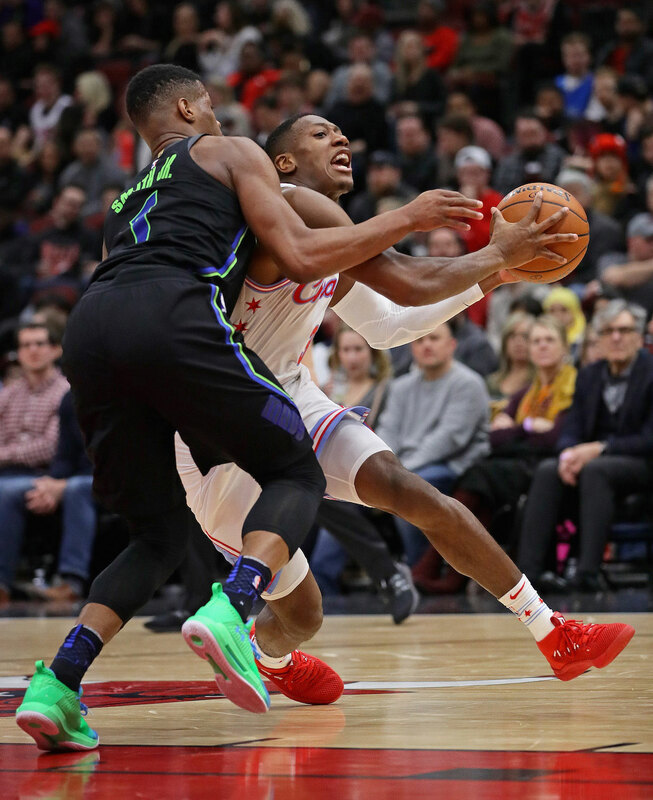 But rookie Dennis Smith Jr. was motivated after Dunn put a career high 32 on him in the Bulls January overtime win in Dallas. Harrison Barnes is quietly still effective, if hardly noticed outside Golden State. He had 26 points. And Dirk Nowitzki keeps on going with 18 points and five of eight three pointers. This looked like a Dallas demolition with that 10-0 start, Smith firing at Dunn, Hoiberg exploding at Felicio after he blew the first play after the timeout following that 10-0 start, subbing in Portis immediately. "Our starts of quarters are an issue; that's got to change," said Hoiberg. "We challenged them to come out and get off to a great start and we didn't, down 10-0 right out of the chute. We have to find a way to get off to better starts. We'll change our starting lineup in the next game with the next five and see what the new look feels and looks like out there." It's as much finding the right players to fit with Dunn, LaVine and Markkanen as to look at fringe players who haven't played much this season. Nwaba continues to impress with his relentless style. Felicio took another step back. Cameron Payne was adequate, though Hoiberg gave first quarter minutes to Jerian Grant, who'd also been out of the rotation. Grant played forcefully in a 9-0 run in helping get the Bulls deficit under 10 at the end of the first quarter. Smith Jr. with 10 first quarter points taking it to Dunn continued their game within the game that goes back to Smith taking out Dunn in their first Summer League game last July. Dunn got Smith in January and Smith had Dunn for most of three quarters Friday. "Kris is not going to back down from anyone," said LaVine. "I knew he was going to try to bring it," added Dunn, eyes brightening about the challenge. "I didn't let that get to me; let the game come to me (early), stay within the game. We're competitors. We understand each other as good players. That's why I like it. He's going out there to kill me and I'm trying to kill him. There's going to be plenty more battles down the road. That's the kind of spirit you need to have. I like that competitiveness." The Bulls cherish that sort of talk from Dunn, who remains wildly inconsistent. Often it seems he needs more motivation than just an NBA game. He played poorly in Charlotte after a good game in Brooklyn, which came after poor games against the 76ers and Timberwolves. Though he shows a tendency to play well after particularly poor games. It almost seems sometimes like he needs a greater challenge. Greatness in the NBA is consistency, being able to expect excellence every game, if not the same production, but close. Dunn continues to be last month's stock market, though he remains a good buy. "I thought Kris played a really good overall game," said Hoiberg. "His floor game was excellent. I thought his attack, when it was there, was really good. I thought he found guys when he needed to. Eighteen, seven and seven, that's pretty impressive going up against Dennis Smith, who really had it going (but was held to one point in the fourth quarter). Kris didn't drop his head when Smith got off to such a hot start. Kris Dunn finds a way to put (poor games) behind him and bounce back. Tonight was a great game; to see him making the right play time after time was fun to watch." The Bulls wedged their way back into the game in the second quarter as Felicio recovered to have his best stretch of the game with an offensive rebound score and six points in four Bulls possessions. That still left the Bulls trailing 42-34 before a pair of strong driving scores from LaVine and then Dunn taking a rebound and going all the way to close the half with the Bulls trailing just 49-47. But then it was yet another poor start of a half, the Bulls immediately falling behind 62-52. "Don't worry about the offense right away, get stops," advised Dunn. "First and third quarters we were worried too much about the offensive end." Dunn got things moving driving the ball and Portis came in powering inside, shooting and, of course, flexing and imploring the fans. "Bobby's a dog, man," said LaVine. "He's doing the duty he has to do down in the post. He makes big plays, he's a tough guy for our team, and he's a glue guy. He means a lot." 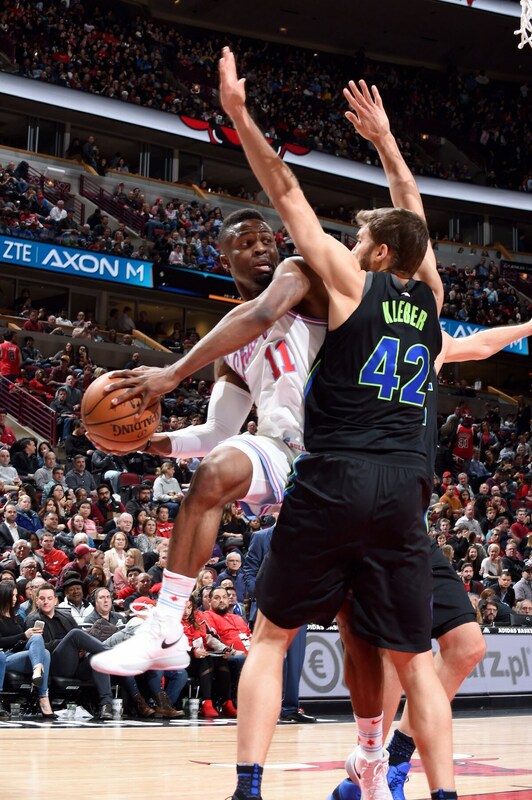 The Bulls, however, trailed 85-78 after three quarters and then Nowitzki started the fourth with a pair of threes, the Bulls falling behind 91-80 and it looked enough like Mavs payback for the Bulls win in Dallas. "I knew I had to put my construction boots back on," said Dunn. Hard hats for everyone, too, the Mavs eventually shooting just 28 percent in the fourth quarter, the Bulls 59 percent. The Bulls were big D, not Dallas. and some big O, also. "All three of them made big plays for us down the stretch," remarked Hoiberg. "They shared the ball. Zach made a great play to get Lauri that open three at the top of the key (for the 106-98 lead with 1:18 left). I thought that was a big time play. Bobby got it going a little bit in the block and we found him coming down in transition. When they took Zach away, Bobby did a great job reading the situation. It was good to see all three of them making plays. The shot distribution was good for the three of them tonight, as well. I thought they played well off each other." First it was LaVine with a three and a nice finish on a drive on the left side. Markkanen got a good pass from Valentine for a three as the Bulls finally began to penetrate enough to draw defenses off Markkanen. Opponents have been running Markkanen aggressively off the three-point line, so he's had to adjust with some pump fakes and steps ins to take the two. But when teammates can draw the defense, Markkanen finally began to find some space on top of the floor, where he rarely misses threes. He was three of five overall. That got the Bulls within 93-92 with 6:41 left and it was game on, though LaVine was out for a rest. Markkanen had just reentered for Felicio and Dunn enter for Payne at that point. But the Bulls went dry through three possessions as Dallas went ahead 96-92 with 5:06 left. LaVine subbed in then for Valentine and the Bulls had probably their best lineup mixture of hustle and defense with Portis, Dunn and Nwaba, rebounding with Markkanen and scoring with LaVine. In those last five minutes, the Bulls would outscore Dallas 16-4. "It's important for our guys to feel this," said Hoiberg. "To get players playing well together, to finish a game in the fourth quarter, to go out and score 30 and hold a team to 15; that's a big step in the right direction for us." First, it was Nwaba with one of those driving baseline slam dunks. Dunn made a steal and dribbling out passed to Portis for the driving score to tie the game at 96. After a Smith miss, Portis scored on a jump shot and absolutely dominated the athletic Powell, who crumbled under the basket. It was 100-96 Bulls with 3:11 left. "Go out and play with an edge on a nightly basis, play with a chip on my shoulder," said Portis. "I want to be one of those players like I used to be in college, be myself like I used to be." Barnes got a score, but the Bulls were coming now, the home crowd urging them on, little talk about draft picks and lottery balls. "We're trying to build a winning culture here," said Dunn. "Whoever says that (losing), that's for them. I don't get into that." Dunn missed on a layup with that two-point lead with 2:29 left, but then Smith missed two free throws with a chance to tie and that was it. Not finding anyone open, Dunn calmly made a three for a 103-98 lead with 1:59 left. Yogi Ferrell missed a three and Markkanen made his. Barnes got a pair of free throws, but it wasn't going to be enough as LaVine added another 20 footer. "Today was a good game collectively," said Dunn. "Everybody played well. It's going to take more games, practices, reps with each other. But today it showed as a team. We've got a lot of talented played who can score the ball. Everyone made plays."